This toy test was performed in France's home daycare. The toy consists of six plastic bowling pins. Each bowling pin is 21 cm tall. The toy also includes a yellow plastic ball with three holes in which children can insert their fingers. The ball's circumference is 30 cm. The toy is sold in a reusable plastic and fabric bag that can be used for storage purposes. It can be sealed with Velcro and has two handles for easy transportation. The goal of the game, as in any bowling game, is to line the bowling pins up on the floor and roll the ball towards them to make them fall down. The manufacturer recommends this toy be used by children who are two years old or older. Since the toy is colourful, it is attractive for young children. The large rounded shape of the bowling pins makes them safe for very young children. Positive points: We really like the bright colors and the fact that the bowling pins are light. We appreciate their rounded shape. The faces drawn on the bowling pins are cute and attractive. The toy seems quite sturdy, mostly due to the quality and thickness of the plastic. 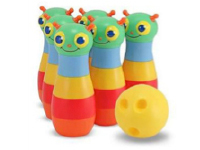 The dimensions of the bowling pins and ball are appropriate and make them easy to grasp for little hands. Negative points: We didn't really find any negative points other than the fact that the holes on the ball are more for show than anything else. The children never really inserted their fingers in the holes. Since the ball is made of plastic, when it is thrown by younger children, it can hurt somewhat. You may want to have a few softer balls on hand (see suggestion below). While children were playing with the toy, I suggested two different variants to prolong the fun. I set a large bin filled with different types of balls (soft balls, textured balls, balls with lights, stress balls, balloons, scented balls, etc.) on the floor. I wanted to provide children with the opportunity to manipulate balls of different sizes and textures. Children enjoyed using different types of balls and attempting to make the bowling pins fall down with them. I invited children to decorate empty plastic bottles by depositing a variety of tiny objects inside them. We then used these bottles as bowling pins. Younger children enjoyed manipulating the bottles as they watched older children make their homemade bowling pins fall down over and over again. 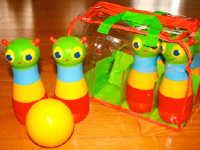 Educatall was happy to give the Bug Bowling Set to France's daycare group to thank them for welcoming me and testing this toy.